Can I add a new participant to a Personal Conversation in the Messenger? I know it must be possible, as I have been involved in a couple of multi-participant conversations, but I just can't figure out how to do it! Yes, Contributing Members can add up to 6 others into a Personal Conversation. (Sorry, this feature is only available to Contributing Members). Look on the left side of your Personal Message for the Add button. Yes, sorry I should have mentioned that. 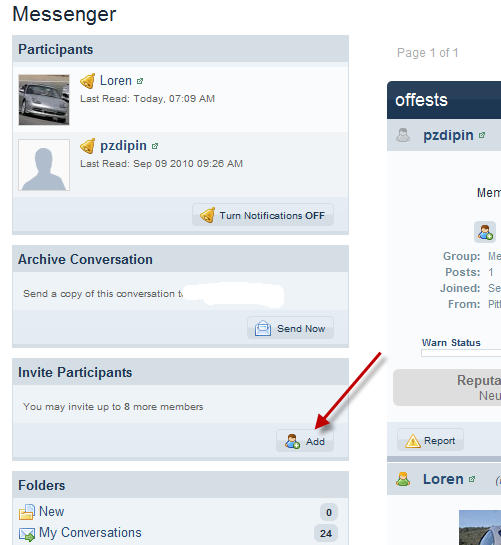 This feature is kind like having a private forum - with invitees only.